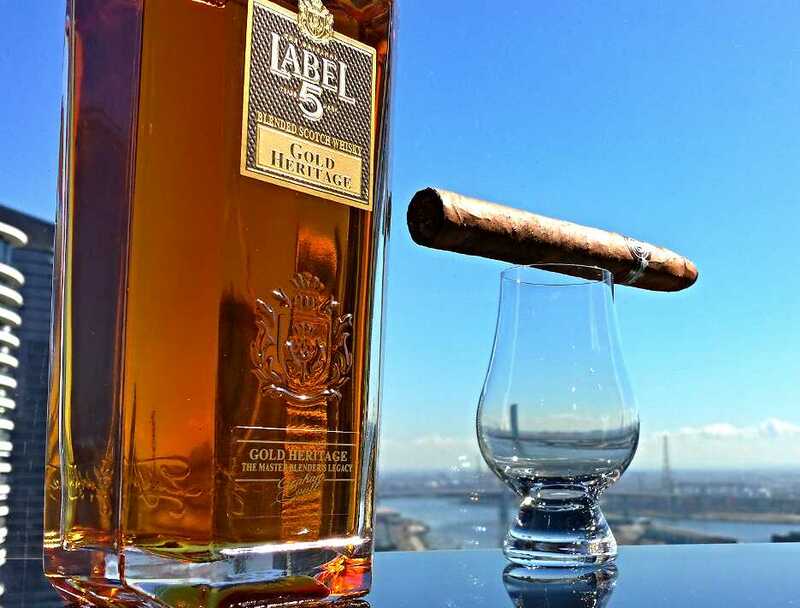 Label 5 is a brand of blended Scotch whisky that is owned by French company La Martiniquaise. Malt Mileage has been very fortunate to secure four bottles from the Label 5 range – “Classic Black”, “12 year old”, “18 year old” and “Gold Heritage”. In this review Malt Mileage tastes the Label 5 “Gold Heritage”. Label 5’s Master Blender, Graham Coull, says that the Label 5 “Gold Heritage” is a “personal achievement” for him, because this whisky is comprised of whiskies from different casks and of different ages that he has personally hand selected and married together. On the nose the whisky offers the mild aroma of mossy and grassy peat that is softened by the sweetness of dark berries, rich golden honey, toffee, vanilla and caramelized peaches and apricots with cinnamon. On the palate the whisky is immediately salty with that mossy and grassy peat travelling seamlessly from the nose, but this time to balance out the peat are dried fruits and dark chocolate coated raisins with hints of vanilla, peppermint crisp and mild surges of spice. The finish is increasingly oak driven, with rich cherry liqueur filled dark chocolate, mild anise seed and a sweetness that shines through bitter dusty cocoa in a similar way to the taste of rose flavoured Turkish delight rocky road that is made with the darkest chocolate. Despite the woody finish, there is not a semblance of misplaced tannin. The whole journey, from nose to finish, is superbly balanced and absolutely delicious. Make no mistake, Label 5 “Gold Heritage” clearly comes across as a whisky that has been painstakingly crafted with care. It is smooth and balanced, projecting rich flavours that result from the harmonious marriage of peat, fruit, oak and spice. This is a throw the cap in the fire kind of whisky, best enjoyed with your feet up while watching a good movie or gazing at the stars with a big fat Cuban cigar. Magic. This entry was posted in Blends and tagged blended Scotch whisky, whisky. Bookmark the permalink.